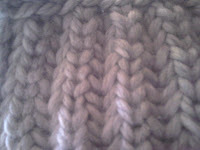 There's nothing I like more than the brioche stitch. It's nice and thick; so very sturdy. I know I posted a video about the two-colour brioche stitch tutorial on youtube, but I wanted to show how the stitch would look with one colour. It's not a very good picture, I know. The digital camera is not with me for the moment, which disappoints me. Anyways, its a very pretty stitch, and the video does a good job of explaining how to do the stitch. You do the steps the same way as with 2 yarns, except you are repeating the second-half round with the same yarn. Also, I was looking up more information about the brioche stitch and found this site which is dedicated to the stitch and its various forms. Check it out! If you've done the stitch, trying the different variations should be easy. Hello. I am interested in knitting the single-color brioche stitch in the round on a loom. I find the Youtube video difficult to follow. Can you post the pattern for the single color brioche stitch, or email it to me? Thank you! Hi, I haven't made the tutorial yet.... Umm, instead of the video, where you go with one colour first, you would just alternate knit, yo, knit, yo on each peg. It is different if you want to knit the stitch in a single panel, or if you are going to knit in the round. I haven't made a tutorial on that yet, as I'm still working on my woven herringbone tutorial. I might be able to send some drawings to you, though. Sorry sorry sorry for the late reply! I've had an extremely stressful year at school, and this is the only break I've gotten in a few months! Umm just to be clear, do you mean the first row of the brioche stitch? The yarn overs? I also just posted a new blog post about it. It's hand drawn, but I hope it answers your questions! Thanks for the link to Nancy Marchant's site. I really appreciate your simple way of demystifying brioche.